Happy Hump Day, y'all! Today I turn 23 and this Michael Kors bag was the perfect early birthday gift to celebrate! My husband knew I'd been wanting a new MK bag to replace my old one that broke earlier this year and he picked a great one! 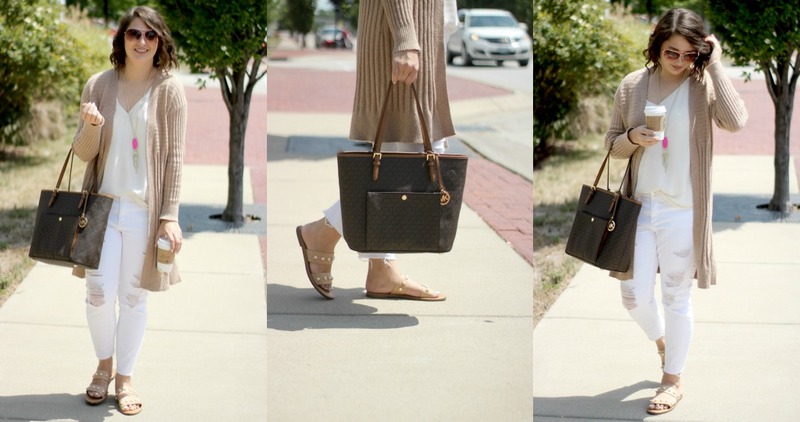 This beauty is going to go with everything this fall and the larger size is perfect for mom-ing on the go. I use the center pocket to hold diapers and wipes and keep my stuff on either side. It's so roomy! I'm also loving this cardigan again this year. I snagged it for around $20 at Kohl's on Black Friday last year, but this year there is a super similar one at Nordstrom. I promise it's worth every penny and goes with sooo much. I love mine because it's so soft and cozy (and a little bit stretchy)! Do you wear white after labor day? Labor Day is only a few weeks away and I am not about to put any of my white pieces in storage! I love how this white on white look easily transitions to fall with a cozy cardi and neutral accessories. White jeans are actually one of my favorite winter closet staples. I pair them with OTK and riding boots, booties + blanket scarves, and dark hued sweaters. What's your go-to fall layering look? I love flannels under sweaters (but hate wearing them that way!) and cardigans over tanks! What a great bag. I recently switched out my diaper bag for a nice tote and instantly feel so much more put together when I'm out and about with my girl. Great cardigan too - I am dying for cardigan weather, especially since its 98 degrees with 90% humidity as I type this!! I totally feel you! I rarely carry a diaper bag for the toddlers anymore, but still need that extra space for a few items! I wish it would cool off here, too! Happy birthday! What a fun gift :-) I love white-on-white for fall transitions too! He definitely picked well! White on white is one of my faves! I am loving that tote! It's definitely the perfect size for packing all the things you need as a mom and it's super cute!